If you like the ID:Core concept but need more power - this is the one! Versatile tones. Excellent balance of features and functionality. Competitively priced. Suffers a little on high-gain leads. UK firm Blackstar continues to expand its already impressive catalogue. The ID:Core Stereo 40 is the top dog in a new range of attractively-priced practice amps that we reckon will also interest more experienced players. 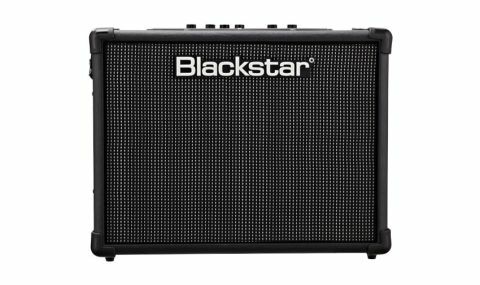 The Core uses a stripped-down version of Blackstar's ID: preamp combined with an external power supply, and features a smart-looking cabinet with integral carry strap. Most importantly, behind the grille cloth, there are two 20-watt, five-inch loudspeakers hooked up to a stereo output stage. "The Core models are programmable, with one patch per voice setting capable of being saved on the amp"
The Core models are programmable, with one patch per voice setting capable of being saved on the amp, but more if you use the FS-11 external foot controller (Stereo 20 and 40 models only) or Blackstar's Insider software, via the USB socket. There's a tap-tempo button for manually setting delay times and a manual mode button, which takes the Core into 'what you see is what you get' mode. "The crunch and super crunch voices offer more versatility than a single crunch sound, with snarl and bite in abundance"
It's crazy how the onward march of technology has taken what were once high-end studio-only techniques, recreated them in the digital domain and brought them down to a level that anyone can use and have fun using with a minimum of knowledge. Beginners will never again be able to blame their amp for sounding bad, but more seasoned players looking for a highly affordable, portable and great-sounding small combo that could easily be used to record your ideas should really check this out, too.